A brief overview of the plot of Magic Study is this: Yelena, the poison taster turned magician whom we met in Poison Study, leaves Ixia for Sitia, the country of her birth, to enter magical training and meet her long-lost family. Along the way, there are family tensions, new friends and enemies among the students and teachers at Yelena’s school, and sinister forces that may claim Yelena’s life, or that of one of her friends, if Yelena can’t thwart them. 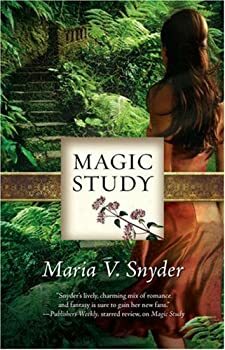 It’s a fast-paced and exciting plot, and I stand by my earlier assertion that Maria Snyder can tell an interesting story. 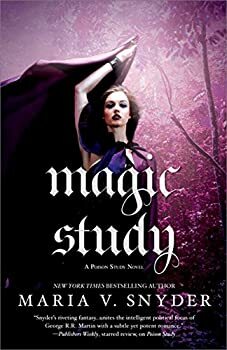 Another issue I had with Magic Study has to do with grammar and editing. I don’t know if this issue existed in Poison Study and I missed it because I liked the story better, or whether the success of Poison Study meant the author was given less editing, but there are a lot of unintentionally funny dangling participles in this novel. I will read the third book in the series (Fire Study), but will almost certainly not buy it in hardback.